Knowing how to stop puppies from biting is vital to raising a well-behaved dog. Puppies are one of the cutest (if not the cutest) things on earth. And if you ever watch a litter of puppies play fighting and wrestling and rolling about, it looks great fun and is just adorable. That said, it’s not really all fun and games though; you’re actually watching a battle for dominance and to become the alpha dog in the pack. There’ll probably be one puppy in particular who tends to win all the play-fights. You’ll notice that they’ll bully their litter-mates. They may bite their ears, paws and tails, and make them yelp. This is the puppy who’ll more than likely end up as the alpha dog. And if you choose that puppy, then once you get them home you and your family will now be their new pack. They’ve already proved their dominance over their litter-mates, so they’re probably going to try and do the same with the kids, the cat, or even any other dogs you might have, including adult dogs. You might find that when you play with them they grab your sleeve and shake their head wildly from side to side, growling crazily. And while this is very cute when they’re little, it won’t be so cute when they’re older and bigger, so you need to put a stop to it. Puppies that are allowed to get away with dominant behavior when they’re young are much more likely to grow into dominant, and potentially dangerous, adults dogs. So you need to learn how to stop puppies from biting. Teaching your puppy not to bite is an important part of their training. So how do you stop puppies from biting then? One way is to teach your puppy to stop the same way that their mom would. If you give them a little pinch to the back of their neck, this will make them release their bite. You should then give them a toy or something else to play with. It’s much more fun, both for them and, in the long run, you too. Another way is to teach them so-called “bite inhibition”. If you think about watching puppies play again, you’ll notice that every now and again one of them will bite too hard and the one that’s bitten will let out a yelp, jump away and stop playing for a while. Soon though, they’ll be back playing again. It’s this reaction of yelping and stopping playing that teaches the other puppy not to bite too hard. And just like they learn to control the strength of their biting from their litter mates, they can learn it from you too. When playing with your puppy, let them grab your hand in their mouth and play with it. Let them do this until they bite too hard and then let out a yelp and pull away from them. Then praise them for stopping or if they now start licking you instead of biting. You can then return to playing with them until they bite too hard again, at which point go through the same process. In this way, your puppy should learn not to bite you too hard. If your puppy’s really excitable you might find they carry on biting when you yelp. If this is the case, you should stop playing with them for a while – take a time out for 20-30 seconds or so before you start playing again. They’ll soon learn to control their biting once they realize the fun stops when they bites too hard, and you should find they become much more gentle with your hands. Give them a toy to play with every time they try to play with your hands. For example, start a game of tug of war with them as soon they start trying to bite you. Alternatively, give them a chew bone to chew on instead of biting you. Puppies often react to being touched, i.e. stroked or petted, by mouthing your hand. If your puppy’s like this, try holding a treat in your other hand while you stroke them. As soon as they start mouthing, give them the treat to distract them. In this way, they’ll gradually become used to being touched without reacting by biting. Use the same time-out procedure as described earlier when discussing how to teach your puppy not to bite too hard. Now though, call a time-out every time they try to bite you at all. If you’re puppy’s an ankle-biter as you walk, a good tip is to always carry one of their favorite toys with you. When they bite at your ankles or feet, stop and wave the toy at them. Your puppy will likely grab the toy. At this point start walking again until they bite again, at which point stop and give them their toy again. If you don’t happen to have a toy with you, just stop until they stop biting at you at which point start praising and petting them and go and get them a toy to play with. Puppy biting might seem cute when your puppy’s tiny and so are their teeth. It won’t seem quite so cute when they’re older and bigger though. 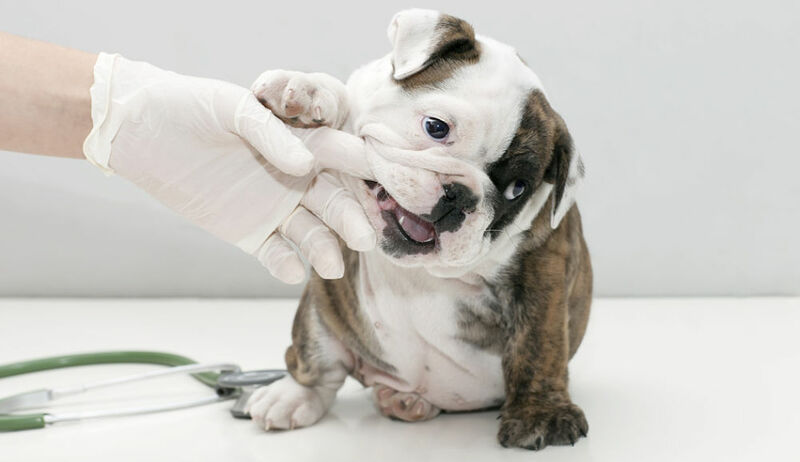 Your puppy should be taught not to bite as early as possible to prevent it becoming a problem later on. The tips and advice in this article should set you well on the way to knowing how to stop puppies from biting.